A spacious, lofty 120 m² apartment with 2 double bedrooms and 1 twin beautifully decorated in an "operatic" style - creating an atmosphere of opulence to make your holiday unforgettable. Perfectly located next to the Carré d'Art (where the grand Nimes Opera House once stood) and Roman "Maison Carré" temple, this is THE place to be in Nimes. There is a modern, fully equipped kitchen, large bathroom with shower, bath and washbasin as well as a separate WC with another washbasin. 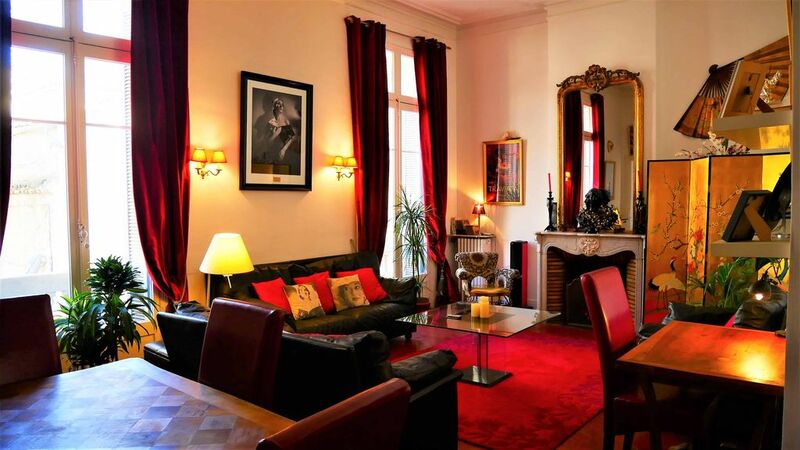 The apartment overlooks a leafy garden, a real rarity in the centre of this historic town. Equipment includes a flat screen "home cinema" system, an iPod HiFi docking station (compatible with iPhones) and a "business centre" complete with PC and high speed broadband. This location places you within a two minute walk from the "Fontaine Gardens", the wonderful 365 day a year food market and a wealth of restaurants for al fresco dining. Rates range from 630 Euros/week for 2 people to 840 Euros/week for 6 people. Underground parking is available (48 Euros/week and prorata) with access next to the apartment. For lots more photos, maps, street view, details of what to do in Nimes and links to (English) Tourist Office sites in the region AND more testimonials, VISIT OUR INFORMATIVE WEBSITE and view our gallery of PANORAMIC PHOTOS at www.diva-nimes.info. Very central very comfy very warm!!!! Wonderful stay in Nimes at the “Diva” apartment. Loved the apartment Diva was really beautiful. Fantastic position near to all historic buildings. Near to the shops and the fabulous market. Nimes is a beautiful city. Gordon met us a planned and welcomed us to the lovely Diva. Kitchen facilities great. Loads of hot water at all times. So glad you had such a good time and made the most of being so close to everything. I was delighted to meet you all - and I'm glad you followed my tip about the market. It really is spectacular ! Hope to see you again one of these days. A lovely place to come home to. An exceptional apartment in a lovely part of Nimes. Gordon was an accommodating and delightful host. I'd recommend a stay here with great enthusiasm! Two friends and myself recently returned from a four day stay at this wonderful apartment. We were met by Gordon who was both helpful and informative. The apartment was was in a great location within walking distance to everything. There were so many interesting things around the apartment, so much character. There was nothing better after a long day of sightseeing and travelling than to return to one of the wonderful CD's on offer, soft lights and a night cap. Oh and such comfortable beds. Thank you so much...I feel we will return. So pleased you enjoyed your stay in Diva-Nimes and made the most of being in such an ideal location. It will be a pleasure to see you all here again some time. About as centrally located as you can possibly be in Nimes, this is the ideal base for exploring the surrounding region (Languedoc, Provence, the Camargue and Cevennes). There is a large underground car park with pedestrian access just outside the apartment building. Motorway access is only 10 minutes away and the central TGV station puts Nimes under 3 hours from Paris. Ryanair flies to Nimes from Luton, Liverpool and Brussels. There are also flights from Rome and Palma. There are concerts in the the Roman arena throughout the summer and an arts and crafts market every Thursday evening in the old part of the town (2 minutes from the apartment). Nearby towns to visit include Montpellier, Uzes and Arles, and no visit would be complete without seeing the Pont du Gard, the amazing 2,000 year old aqueduct built by the Romans to bring water to the town of Nîmes. And if guests happen to be opera or ballet lovers, we extend them a special invitation to enjoy free High Definition screenings in our unique "Home Opera Theatre". Full details on request.